They say that Upper East side apartments are the best well priced apartments in Manhattan. From High-rise to prewar buildings and from townhouse to Brownstones, there are huge and small and expensive and cheap Upper East side apartments for every taste and budget. 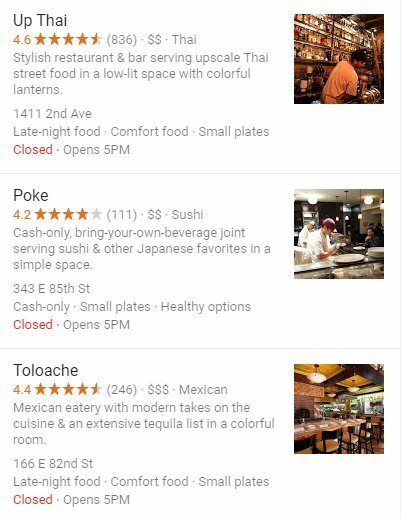 With so many restaurants on the Upper East side it may become a dilemma to make a decision where to eat. Doesn't matter if it is down second avenue, or up on third and First avenue, with both sides of the avenue paved with restaurants, cafes and even comedy clubs on both sides. Most desirable neighborhood for well priced apartments and economic budget walk up rentals. However once you go west of Lexington avenue, rental and sale Upper East side apartments may surprise you with a higher price tag. The motto is the closer that you get to Central Park the more you will pay. The upper east side is home of the 10021 zip code, which according to Forbes magazine is one of the most expensive zip codes in the country. Plenty to do on the Upper east side. For starters this area host the Metropolitan Museum of Art and the Guggenheim museum. with a vast collection of art and one of the largest in the world, the Met is worth the trip. Right on 86th street and 3rd avenue you will find the famous Papaya King. Here you can get natural juices, the original hot dog and papaya juice. Cheap and tasty hot dogs that have been featured in many Hollywood movies. True the upper east side doesnt have a Zabars but they do have an Eli's. From the same founders of Zabar, Eli has created a superb grocery store, where you can find just as many wonderful items as in Zabars without having to travel cross town to the Upper West side.